Snow Removal Services is a full service snow removal company that offers residential and commercial services. We often hear people talk about “wet snow” vs “dry snow”, but what does all this talk really mean? The density of snow varies as a function of the temperature. Most of our wet snow occurs when the temperatures are near freezing in PBL (The planetary boundary layer is the lowest layer of the troposphere where wind is influenced by friction) or when soil surface temperatures are above freezing. Wet snow is partially melted, which increases its density. Kids love this type of snow since it is great for snowballs and snowmen. However, it is a little more difficult to shovel but will not drift and blow around. Dry snow occurs when the temperatures are warmest in the PBL and the soil surface temperature is below freezing. This type of snow is not very dense so it can accumulate much faster and to a higher depth. This type of snow is notorious for drifting, but is typically easier to shovel. The flakes of dry snow tend to be smaller but there are more of them. Nobody likes winter snow storms, especially the ice that comes along with them. It already seems like a daunting task to shovel the driveway in cold temperatures, but then what do you do with all that ice? Today, we have two options to go over and which may be the better for cutting down the ice and saving your yard or concrete. Rock salt is the mineral form of table salt, which forms into large crystals. Salt helps to lower the freezing point of water, so this method has been used to cover roads to keep them from getting icy. A few things to note, salt only works in temperatures above 12 degrees Fahrenheit. One downfall to using salt is that it can be harsh on grass, shrubs, and can also eat away at concrete or steel. Unlike rock salt, sand will not melt the ice. Sand is abrasive and this helps to create traction when applied on top of the ice. Sand will work at any temperature, but it usually has to be reapplied because it typically gets buried under snow. If sand is not available, other abrasive materials can be used as a substitute (kitty liter or saw dust), but will need to be cleaned up after the storm. Excessive amounts of debris can clog drains, so it is important that you clean up after each use. I personally like to use sand for larger areas, such as parking lots. It is usually less expensive than salt and will not eat away at the concrete. Salt can be a good choice for high traffic walking areas, especially on the sidewalks of a business. It all comes down to personal preference, but remember one of the best solutions is to keep snow off your driveway and shovel often. When it comes to keeping you safe and clear during winter, the best Omaha and surrounding area snow removal companies make use of a variety of commercial snow removal equipment. Since not all situations are the same, professionals must employ specific equipment and custom ice removal treatments to specific situations in order to be effective. To help you understand the process, we’ve put together this helpful insider’s guide to commercial snow removal equipment. At Snow Removal Services of Omaha, we enjoy not only keeping your Michigan business’ roads, parking lots, and walkways clear, but we also enjoy broadening your understanding of the industry that we love. If you have further questions or comments, or if you would like to learn more about our services, please contact us or comment below. Got snow? We bet you do. If your back has been aching after a long winter of shoveling or blowing snow, maybe you’re doing it wrong. Here’s some advice from Consumer Reports home experts that’ll make clearing snow a little easier and get you through the rest of the winter injury-free. Snow blower safety. Finger injuries, including amputations, accounted for about half of the more than 3,300 estimated emergency-room visits related to snow blowers in 2012. Back and shoulder strain were also common. Experts say to take frequent breaks to avoid overexertion and never clean the auger with your hands. Hado recommends clearing your driveway in two stages. First push the snow to the edges with a pusher shovel, such as #8 in the graphic below. Then use a garden variety shovel with sides, like #2, to shovel what’s left out of the way. Your best bet may be a versatile shovel configured for throwing, lifting, and pushing, like #1. If you have uneven pavement, an all-plastic shovel without a steel edge is less likely to catch. Shoveling safety. An average of 11,500 snow shoveling-related injuries were treated in the ER each year from 1990 to 2006, according to the Center for Injury and Research Policy of the Research Institute at Nationwide Children's Hospital. One in three of those injured suffered lower back problems followed by injuries to the arms, hands, and head. 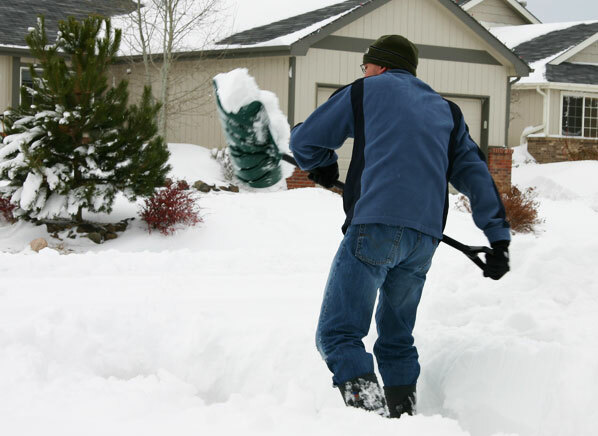 Slips and falls accounted for one in five mishaps and 15 percent of the injuries were caused by being struck by a snow shovel. No matter what snow removal method you use, try to avoid driving or walking on the snow before you get started. Packed snow is harder to clear. And if the snow is sticking to the shovel or the snow blower’s shoot, spray either with silicone or, in a pinch, a cooking spray. To find the best tools for the job, check our appraisal of snow shovels as well as the results of our snow blower tests. And to make sure your cleared surfaces stay that way, see which ice melt works best and are safest for your pets and your property.